A portable blender is a great solution for eating healthy when camping or tailgating, while also having fun making smoothies outdoors! If you’d like to have a blender that’s both cool and can travel with you anywhere you go, you're going to love this. The type of portable blender I'll be focusing on here, the gas powered blender, is portable yet doesn’t sacrifice the high power and speed of some traditional blenders. Why choose a gas powered blender? If you like to tailgate, spend a lot of time on the beach or go out camping, then you know how important it can be to have a lot of your kitchen essentials with you on the go. However, if you want to make your experience better and have more than just the essentials, then you’re going to love the idea of a portable blender. 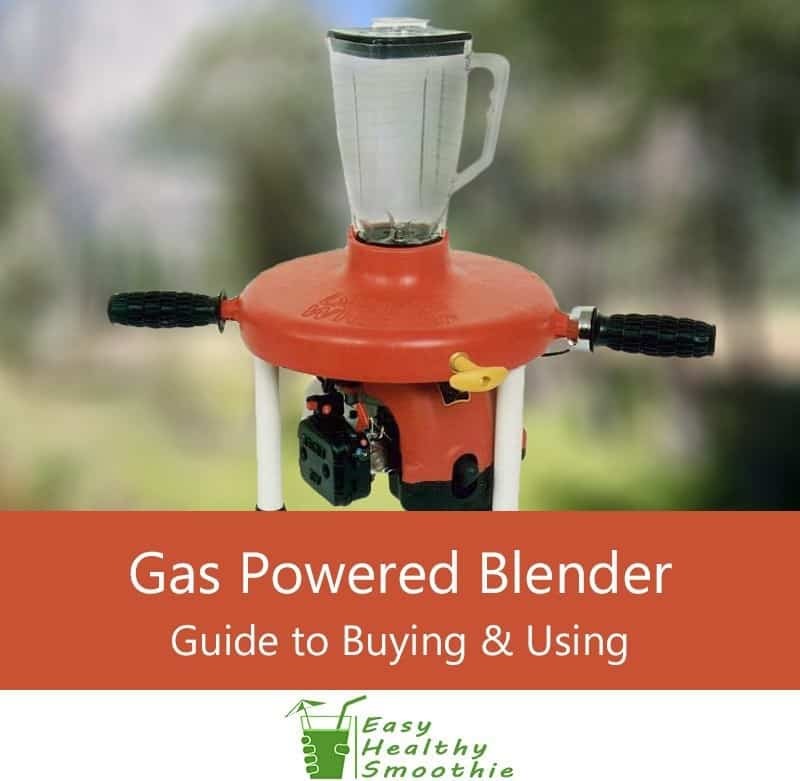 I've tried several types of portable blenders, for outdoor activities ranging from camping, pool parties and tailgating, and overall I found a gas blender to be the most convenient solution. You can easily take it with you wherever you need to go but you’ll still have all the power you need to blend great smoothies - 2 horsepower to be exact. When you eventually decide that you want to go with a gas powered blender, it is important to make sure that you find one that will fit all of your needs. The following are some of the top things you need to keep in mind before you make your purchase. If you choose to buy a blender that doesn’t offer a lot of power, you’re going to be wasting your money. Try and find a blender that offers enough horsepower to blend up all the ingredients with ease. If you’re going to be making smoothies or drinks for a lot of people, make sure you are not buying something with a small capacity that can only make one or two smoothies at a time. Depending on your use, make sure you get a blender capacity that matches your needs - single or double serve, family sized or even more. Once again, this is going to depend on your needs but the faster the blender, the better off you are going to be. If you want to make a lot of drinks in a short amount of time, be sure to pay attention to how fast the blender can make drinks. Some of the blenders are going to include extra features with your purchase such as a pourer to pour the drinks and some other features that could make your life easier. These are not necessities, so don’t let these nice-to-haves make or break your decision. Fortunately, when it comes to a product like this there are so many different uses for it. Depending on your situation, you may find yourself using this blender at one of the following places that make up some of the most popular uses for the blender. If you enjoy heading out into the woods for a nice long camping trip, or like to eat healthy while surrounded by beautiful scenery - this is perfect for you. One of the biggest challenges with camping is the absence of modern day conveniences. If you bring this blender with you on your camping trip, you’ll be able to whip up delicious smoothies or blended drinks with no need for extensions cord or generators. If you own a company or you work for a company that likes to reward staff members for all their hard work, then you know how great outdoor parties can be. If you want a way to take the outdoor party to the next level, a gas powered blender is the best way to do so. This blender packs in plenty of power so that it can whip up smoothies and other drinks right before your eyes! The only thing better than being on the beach? Being on the beach with a smoothie in your hand. If you frequent beaches and want a great way to refresh you and your friends while laying out in the sun, this smoothie maker is the perfect option to take with you at anytime. In just seconds, you can mix up anything you want on the beach to have a delicious frozen beverage. Do you like to tailgate? Nothing says getting ready for a big game like grilling out burgers and sharing some drinks with your friends. But wouldn’t it be great if you could take that tailgating experience to the next level? 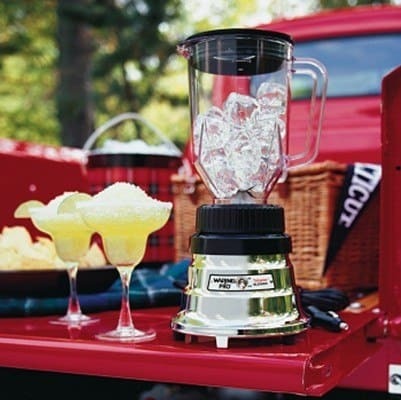 With this blender, you’re going to have everything you need to make blended drinks on the go, which means your tailgate party will be the best one at the stadium. With gas blenders you get to take the power of the blender with you on the go so that you don’t have to rely on extension cords or generators. However, when looking at this product on its own, it has plenty of benefits as well. The two-horse powered Homelite motor comes with plenty of power to help ensure that you have no problem breaking down all of the ingredients you put into the blender. With that kind of power, it will whip up a smoothie surprisingly fast and effective. Additionally, with your purchase you are going to get a bottle for mixing the gasoline and the oil together, as well as a free can of oil to get you started right away. 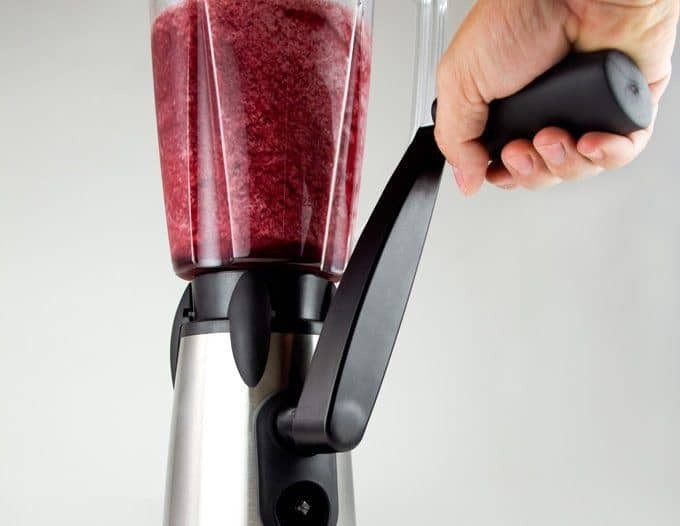 This blender is for anyone who wants to pack in the power of a great blender without having to lug around all of the extension cords or generators that are needed to power some of the normal blenders. If you don’t have access to power where you want to use a blender, then this is going to be one of the best choices for you, especially when you consider the power of this blender. This product is not going to be a great choice for someone that needs a blender but has access to both electricity or a generator. Since this is a gas-powered blender, there is no reason for you to buy this one if you don’t need to run it with gas (well, except for it being so cool). When looking at some of the online reviews by verified buyers, everybody seems to love this particular blender and find that it is one of the best gas powered blenders that they have used. One users says that it works like a champ and is incredibly powerful while another user states that the blender was such a hit at their campsite that they had people stopping by all day to find out what they were using! It’s safe to say that this particular product is a hit and is one of my personal favorites out of the blenders that I have looked at. Not a fan of this model? If you want something similar to this blender but less "motorbike" style, then these are going to be some of the better alternatives that you are going to find on the market today. Designed for outdoor mixing, it doesn’t draw very much power. This means you should be able to use it time and time again without making your car or boat die. Despite a relatively weak motor, the Tailgater does handle ice pretty well. Don’t expect the performance of expensive types of regular blenders but it will get the job done. The GSI is hand operated, meaning that you can make any blended beverages your heart desires while camping. No electric cord needed, no gas, no battery and no charger. Just a plain old crank and the job gets done. This model is currently discontinued, and we’ll update when it’s back on the market. 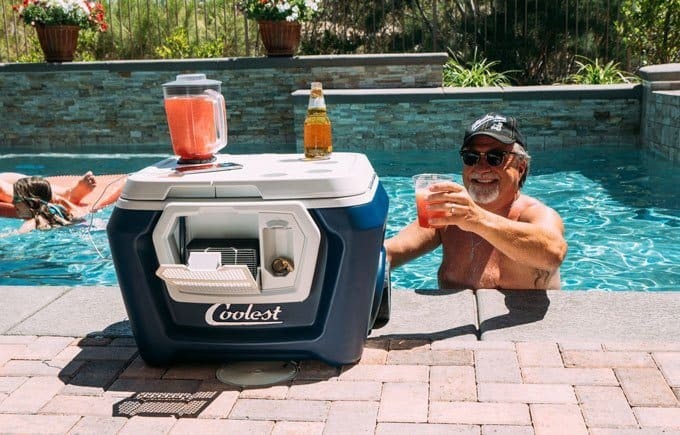 Its name is totally justified, as it will both serve as a great outdoor cooler, stylishly designed, and also as a blender. The Blender pitcher is sold as a separate accessory mounted on top of the cooler, as you can see in the above picture. If you’re looking for a blender that you can take anywhere you go, then this is going to be the perfect blender, requiring no external power source or recharging. This product is going to provide you with plenty of power to make any smoothie you want, it has enough blender capacity to make several servings, and works fast enough to make smoothies for an entire group in a short amount of time. This blender is going to be a great choice for you if you are looking for something that is easily portable and will make great smoothies wherever you might be. As always, please feel free to comment your opinion below and let us know if you have used this product and what your experience has been! If you enjoyed this review and know others who might be interested, feel free to share the article as well! I’ve not thought about a gas powered blender before but I can see they’re a great choice in some situations. Thanks for enlightening me! Gas powered blenders definitely have their uses in some situations, especially if you’re like me and can’t bear to part with your blender even temporarily!